Fellowship Reviews: For What it's Worth: Why Not an Invaders Movie? For What it's Worth: Why Not an Invaders Movie? 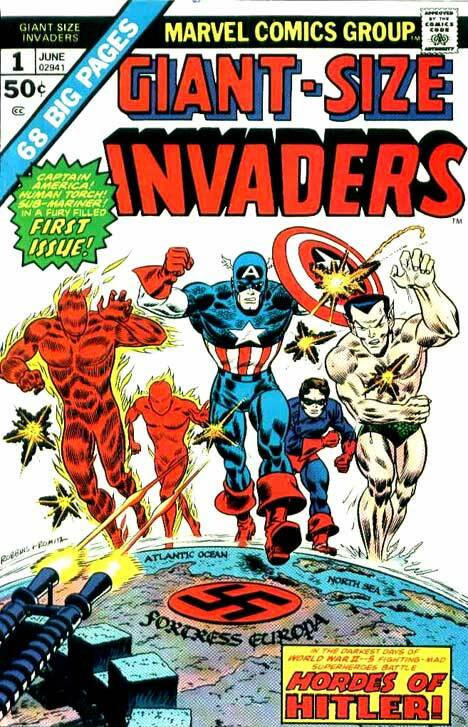 I know I'm not covering any new territory here, but seeing Captain America: The First Avenger and the teaser for The Avengers, I've started thinking again about a movie adaptation of the World War II super hero team The Invaders. I figure, "Why not?" But, how would you handle it? Do you take the same approach as the Avengers? What I mean is - the lead characters having their own movie, then the team-up? Or do you just throw them all together? And what about film rights? Who owns what? According to one report, Universal may no longer has the rights to Namor, the Sub-mariner. The other question is Jim Hammond, the android known as the Human Torch. Now, 20th Century Fox has the rights to the Fantastic Four's version of the Human Torch (once played by current Captain America - Chris Evans, but you knew that). So, can the code name be used in the Invaders movie? They could just call him "Torch" or by his given name of Jim Hammond. The character has already been introduced into the Marvel movie universe by his cameo in Cap. As to the other members, well you've already introduced Bucky, then you have Torch's sidekick Toro (also a human torch), the speedster Spitfire (Lady Jacqueline Falsworth Crichton), and Union Jack (Lord James Montgomery Falsworth), an adventurer and British government operative.That will be the core group. To add more will crowd things up a bit. Will this happen, probably not, but it's fun to think about it. On the other hand, I never thought we would see an Avengers movie.